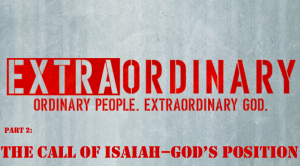 As we continue our series Extraordinary, we will look at the story of Isaiah’s encounter with God. We will discover that Isaiah is a lot like we are– living in a time a lot like ours. We will also see that Isaiah has an encounter with God that changes his life. I also want to remind you that we will have a Potluck lunch following the service at the Haupt’s house (1317 Conrad Lane, Virginia Beach). Please join us after the service for food and fellowship. If you can bring some food to share, please do! If you can’t– you’re welcome to come, too!